UnderLA is an installation commissioned by the City of Los Angeles for CURRENT:LA WATER, LA’s Public Art Biennale July 16 – August 14, 2016. 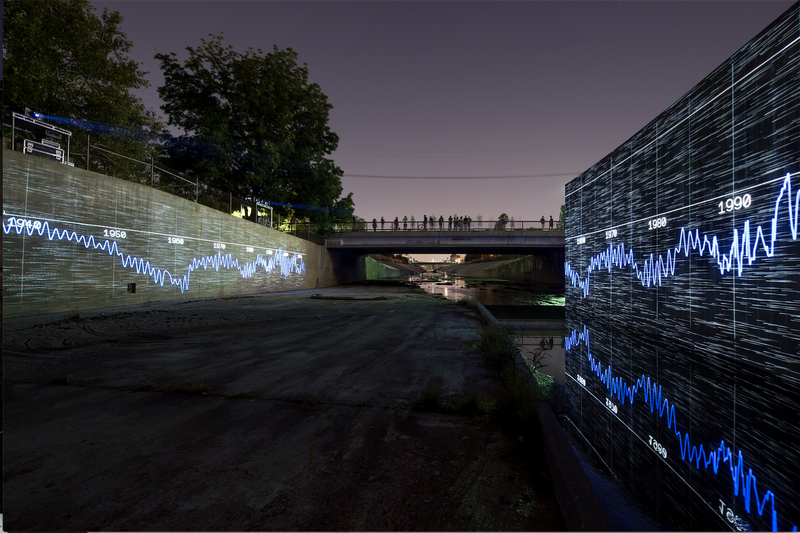 Anadol and Weil’s UnderLA: First Street Bridge and The Origin of the LA River, is a visual descent below the surface of Los Angeles via scrolling images of lithologic soil samples. The photographed samples are taken by geologists at 10-foot intervals from the surface to 1400 feet below the ground. At one thousand feet the images represent material dating over a million years, at fourteen hundred feet as far back as 2.5 million years to the Pliocene Epoch. To create this piece, the artists worked with USGS Geologists to obtain data and photograph soil samples from two Los Angeles monitoring well sites. They digitally processed the individual photographs to produce monumentally-scaled projections. The 27-minute videos are interspersed with data visualization sequences created from 3D lithologic models and hydrographic well data showing fluctuating water levels from these same wells – a reminder that LA’s aquifers are stressed by the continuing drought. The combined imagery represents a landscape portrait updated for arid times, a visual creation story in vertical sections revealing the beauty and vulnerability of the aquifer system. The sequences were projected across the banks of the Los Angeles River at two sites: The First Street Bridge in downtown Los Angeles and at the Origin of the LA River in Canoga Park. The First Street Bridge, built in 1929, was designated an historic monument in 2008, The Origin of the LA River marks the coming together of Bell Creek and Arroyo Calabasas.